Well, here is the first delicious thing I made with my surplus of citrus from this past weekend. I know for most of you it is snowy and cold, but for us here in Southern California it has been very sunny and warm this past week. We have been having summer-like weather and there is nothing better on a warm summer day then a refreshing bowl of ice cream. 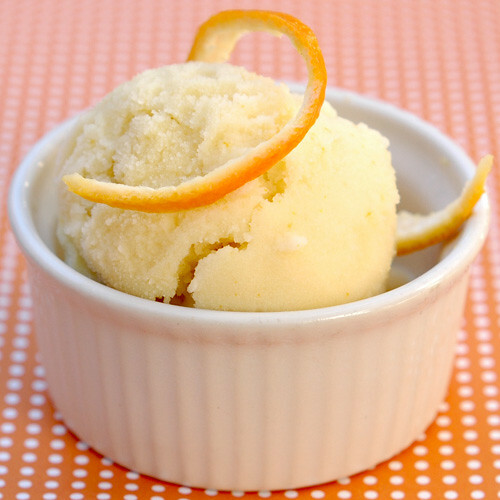 With all the fresh oranges from my neighbor’s tree and the warm weather, I immediately thought of my favorite childhood summer treat…orange sherbert. My grandparents would always have those fun 50/50 cups with the wooden spoons when we would go and visit them in the summers and my brothers, cousins and I loved to sit in their big back yard and enjoy the warm summer air and our tasty dessert. This recipe is fantastic and with the first bite I smiled and felt like I was that little girl again in my grandparents back yard. It was a big hit with the rest of the family too. I can already predict that I will be making this recipe often this summer and I definitely plan to make my own 50/50 version too! You will soon learn that I have a huge love for all things ice cream and after buying the book, The Perfect Scoop, by David Lebovitz, all I wanted to do is try all the ice cream recipes in the book, like NOW! If you do not own this book then I highly recommend that you get a copy or put it on your Christmas list, because if you plan to make homemade ice cream at all, you HAVE to have this book! 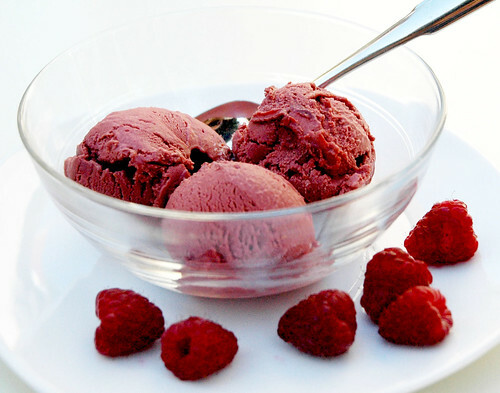 Process the raspberries in a blender or food processor. To remove seeds, press the berries through a mesh strainer. Set aside. In a large saucepan, whisk the cream, cocoa powder, and sugar. Heat the mixture, while stirring constantly, until it reaches a full boil and begins to foam. Remove from heat, and add the raspberries. Chill the mixture thoroughly and freeze according to your ice cream maker’s instructions. Makes about 3 cups. Pumpkin, pumpkin, pumpkin! I just can’t get enough pumpkin! Who says just because summer is over that we need to put away our ice cream makers? Well, if anyone says that, then I say they are nuts! 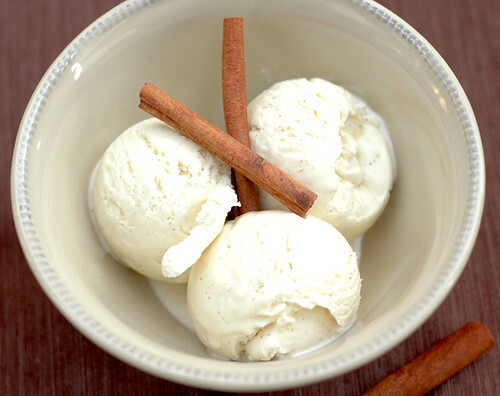 Ice cream is great all year round and there are some especially wonderful flavors to try during the holidays. YEAH! I can’t wait! Even though I have a few other pumpkin recipes that I am going to be making this week, when I saw this recipe I just HAD to try it right away, and I am so glad that I did! 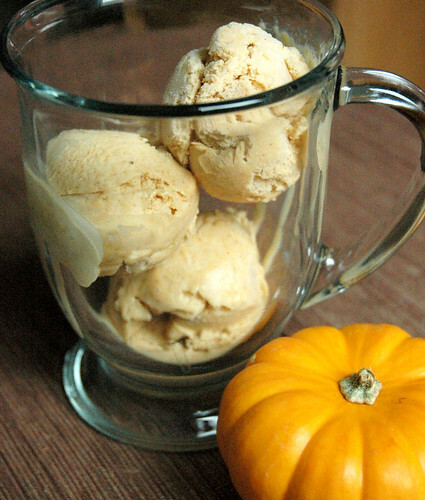 This ice cream is so creamy and smooth and it is filled with lots of cinnamon, ginger and nutmeg that accompany the pumpkin so well. 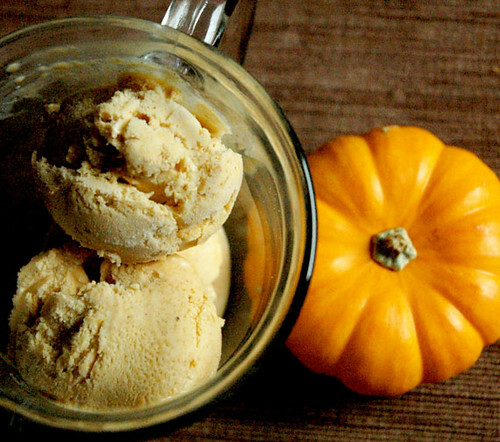 I love a pumpkin spice frappaccino on a warm fall day, but the flavors in this creamy ice cream blow the frappaccino right out of the water. This ice cream is fantastic and I highly recommend that you make it soon! Then grab a bowl and a spoon and snuggle up under a cozy blanket and enjoy this super tasty ice cream. In a small bowl, whisk the egg yolks: set aside. Warm the milk, cream, sugar, spices and salt in a medium saucepan over medium heat until the edges begin to bubble. Meanwhile, prepare an ice bath by placing a medium-sized metal bowl in a larger bowl filled with some ice and a little water. Set a mesh strainer on top. Gradually add half of the milk mixture into the egg yolks, whisking constantly. Turn the heat to low and scrape the yolks back in to the saucepan. Stir constantly, scraping the bottom with a heatproof spatula, until the mixture thickens and coats the spatula (between 160˚ – 170˚F). Working quickly, pour mixture through the strainer and into the bowl with the ice bath. Stir in the brown sugar until dissolved and cooled. Chill thoroughly in the fridge, preferably overnight. Once chilled, add the vanilla and pumpkin puree. Whisk until incorporated, then press through a fine-mesh strainer. Freeze in your ice cream maker according to manufacturer’s instructions. Freeze for at least one hour before serving.